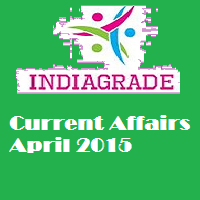 Current Affairs 5th April 2015: If some one preparing for government examination such as UPSC, SSC, state govt public service commission then you must have to read this section daily. So only you can able to clear the competitive exams. Our www.indiagrade.com website provide important capsule on April 4th, 2015. Most of the questions asked only from current trends. So you must know the daily updates in international, national, business, sports etc. Candidates can download the April month current affairs as a pdf format and use it for future studies. So we request all the aspirant to get this offers. You can also refer your friend to see INDIAGRADE portal regularly to know daily updates in government, private exams. 1,800 Indians evacuated from war-torn Yemen. Fidel Castro makes first public appearance in 14 months. Bangladesh: Ex-premier Khaleda Zia gets bail, returns home after 3 months. Malaysia helicopter crash kills 6, including ex-envoy to US. Tamilnadu: Former Agriculture Minister Krishnamoorthy arrested by TN CBCID in connection with S.Muthukumarasamy death case. Jaish-e-Mohammed planning Fidayeen attack in Delhi Intelligence Bureau has issued an alert to Delhi Police about a possible terror attack in the national capital. Farmers in Haryana will get a minimum compensation of Rs.500 for crop loss due to unseasonal rains. CM Arvind Kejriwal and Deputy CM Manish Sisodia launch anti-corruption helpline 1031 in Delhi. Delhi International Airport wins Golden Peacock award. Central Bank of India has topped the list of public sector banks with maximum bad loans including restructured assets as a percentage of total advances. Serena Williams beats Carla Suarez Navarro to win Miami Open. IPL 8: 30,000 tickets released for star-studded opening ceremony. Arsenal overwhelm listless Liverpool with 4-1 win in Premier League.